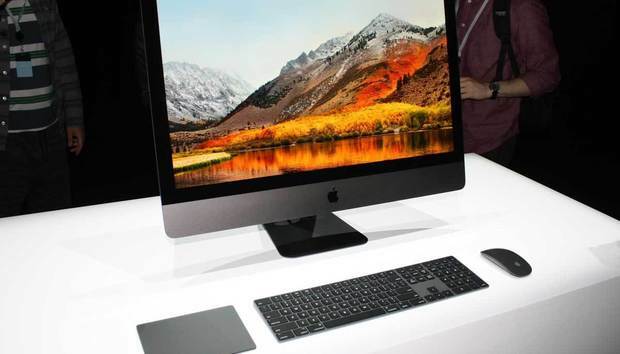 When Apple unveiled the new iMac Pro at WWDC in June, Phil Schiller promised that the new machine would begin shipping in December. With just a bit over two weeks to go, Apple is making good on its promise. Apple has announced that the iMac Pro will be available beginning Thursday, Dec. 14 starting at $5,000 for an 8-core Xeon procession, 32GB of RAM, an 8GB Radeon Pro Vega GPU and 1TB SSD. That’s a lot of machine, but it’s hardly maxed out. Customers will be able to customize the iMac Pro up to an 18-core Xeon chip, 128GB of RAM, 16GB GPU, and 4TB hard drive. But as Marques Brownlee points out, you might want to pony up some extra cash up front. Brownlee got a chance to play with the new 10-core machine for a week, and while he praises the speed, he notes that the iMac Pro isn’t user upgradeable. Even the RAM door that is on the back of the 5K iMac is gone, which will surely upset power users. But Brownlee still praises the iMac Pro for its Space Gray design, and was impressed with how quiet it was on his desk, even when working with 8K video. He also notes that the machine comes with a black Lightning cable to charge the Magic Keyboard and Mouse, a first for an Apple device. But there is hope for those of you who want a top-of-the-line upgradeable Mac. Apple announced earlier this year that it is “completely rethinking the Mac Pro” with an eye on a 2018 release. In the meantime, Apple is still selling a $4,000 Mac Pro with an 8-core CPU and an AMD FirePro D700 GPU, but even with a $1,000 premium, the iMac Pro is still a better deal. For one you get a 5K retina display, but just as importantly, you get four USB-C Thunderbolt 3 ports. The Mac Pro doesn’t have any. Apple hasn’t announced pricing for the other models of the iMac Pro yet, but you can expect them to cost big bucks. For example, Apple charges an extra $2,000 to go from a 8-core chip to an 12-core one on the Mac Pro, as well as $1,200 to upgrade the RAM from 16GB to 64GB and $600 to from a 256GB SSD to a 1TB one. That means a fully maxed out iMac Pro could easily top $10,000 and possibly approach $15,000. Brownlee says the 16-core model won’t be shipping until next year. Apple will begin taking orders for the new iMac Pro on Thursday. The impact on you at home: The iMac Pro is a great machine for sure, but Apple’s decision to lock it down is a little upsetting. Anyone who buys it is going to need to anticipate their needs five or 10 years down the line, and with Apple’s build-to-order prices, it could be very expensive even for a mid-range model. So once again, Apple’s power users are stuck between waiting for a new Mac Pro or settling for a machine that might not be good enough in a couple years.